Microbats and Time of Night | Friends of Native Wildlife Inc. Preliminary results suggest that most of the locally common bats, such as Gould's Wattled Bat, prefer the first part of the night. However one species, the White Striped Freetail (Austronomus australis) appears to prefer the middle of the night. Much of the data we have collected is limited to the first couple of hours after sunset, and would therefore bias these results. However this bias makes the different profile of the White-striped Freetail more remarkable. 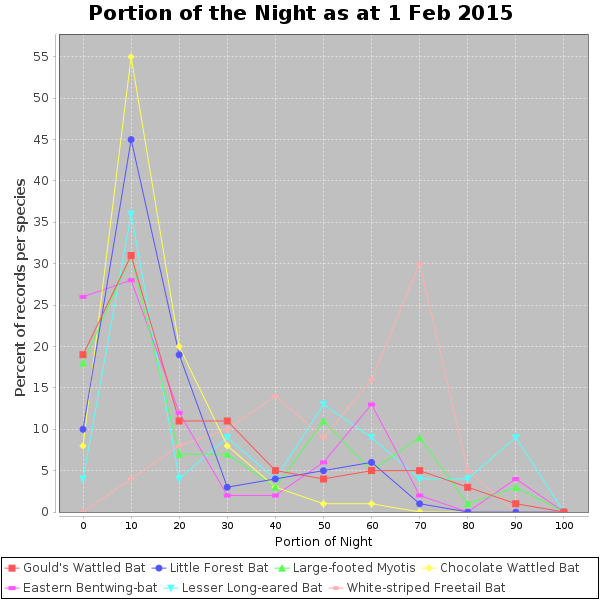 As this project continues we will be gathering more whole-of-night data. It will be interesting to see how this analysis changes as our dataset becomes more complete. In case you were wondering, this analysis deals with the differing length of the night during the year by calculating sunset and sunrise times, and converting the time of the bat call to a percentage of the time between sunset and sunrise. So in the chart above, 0 means sunset, 100 is sunrise, and 50 is midway between the two. We still have a lot of data collection and analysis to do. If you'd like to join our growing band of helpers, please contact us and let us know your interests.